← Mastercard gift card spending opportunity at Staples. 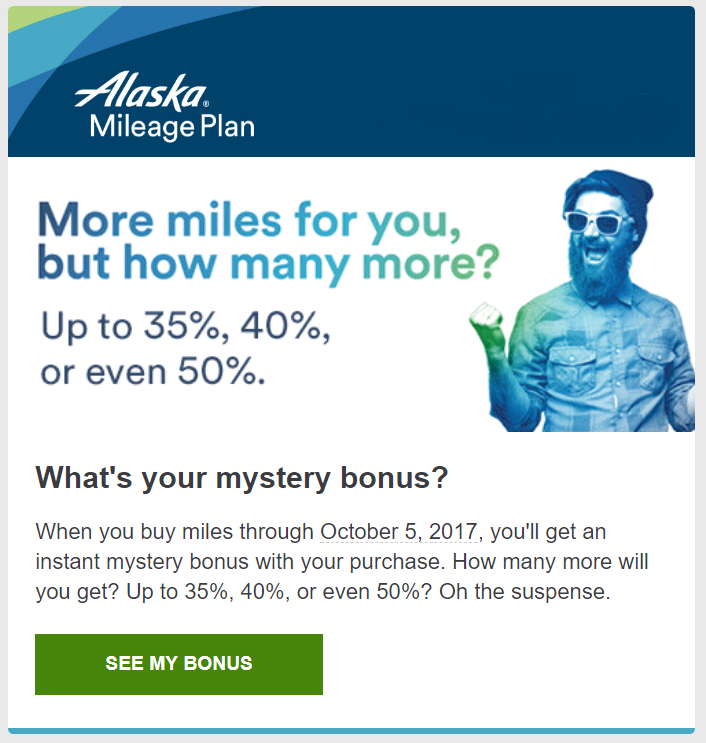 Each member received an email offering a target bonus on purchased miles ranging from 35% , 40% or 50% extra when buying a specific amount of miles. Since Mileage Plan miles, in my opinion, are one of the most valuable miles for redeeming long distance flights on partner airlines like Cathay Pacific, Japan Airlines and Qantas, now is a great time to purchase miles for a fantastic redemption if you received the highest bonus percentage. Unfortunately, I didn’t. Only recently opening my Mileage Plan three weeks ago, that might be a reason for receiving the lowest percentage bonus offering. Alaska Airlines is fantastic and currently require the least amount of miles for flying round trip first class to Hong Kong on Cathay Pacific. I am looking forward to the next promotion to top off my account.